Thousand Islands Regent, Husein Murad encourages fishermen to develop fish farming in Thousand Islands because currently they can't fish optimally on the sea due to west wind.
" I encourage fishermen to develop fish farming more optimally because now is entering west wind season"
"I encourage fishermen to develop fish farming more optimally because now is entering west wind season," he stated, Thursday (1/31). 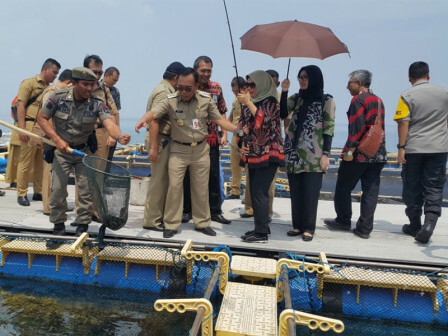 According to him, fishermen should join fish farming group trained by Thousand Islands Maritime Agriculture and Food Security (KPKP) Sub-department thus they can learn how to do fish farming using floating net cage (KJA). "KJA system makes fish farming can be developed continuously without relying on nature," he conveyed. Fish farming is considered beneficial more than usual catch because fishermen don't need to depend on the nature. Currently, there are 24 fish farming groups in Thousand Islands. He hopes this number could be increased every year. "It is also potential to be developed as a tourist destination, such as culinary tourism," he mentioned.